Dolphin swim from Miyakejima, Tokyo. Diving in Miyakejima. .Miyakejima is a circular volcanic island about 180 kilometers south of Tokyo and about 30 kilometers long, with a few days exceeding 30℃ in summer. The landscape produced by the volcanic activity is unique, and our guests say it seems to have come to another planet. On the other hand, islands are rich in ecosystems, and you can hear not only marine life but also the songs of many wild birds on the island. There are also rare forests with many huge trees on the island. On sunny days, the setting sun and moon are beautiful, and the starry sky you can actually see is as good as a planetarium. It is smaller than the dolphins often found in the aquarium. Gray and white two-tone colors look very beautiful in the sea. 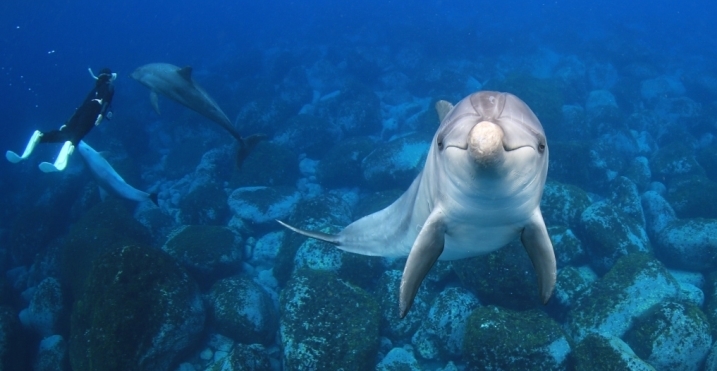 Enjoy the excitement that wild dolphins are approaching. You may be able to make eye contact with each other. The sea of Miyakejima, where the Kuroshio Current, which is a large warm current, is frequently seen, is located at the northern end of the subtropical zone and is surrounded by the deep sea. As a result, you can sometimes see colorful tropical fish, corals, and fish coming from the deep sea. You can also enjoy the topography of the arches and steep walls created by the lava flow. The main access to Miyakejima is a large ferryand a small plane. In particular, a departs daily at 22:30 from Takeshiba Wharf in Tokyo (the nearest station is JR Hamamatsucho Station, etc.). On weekends, we take a ferry on a Friday night and arrive the island the next morning. We will arrive at Takeshiba Pier in Tokyo at 19:45 or 20:40 on Sunday.